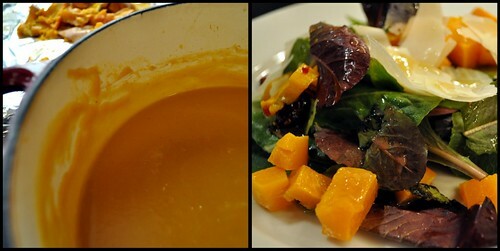 I wouldn’t recommend serving this soup and salad together since they are both made from butternut squash. But, if you’re looking for ways to use up a squash or two, I highly recommend you try these. BAH Note: I prefer my vinaigrette to have more acid than olive oil. Add additional olive oil to the dressing to get it how you like it. Ina uses 1/2 cup olive oil to the 1/4 cup vinegar and juice reduction. Place the diced squash on the foil lined sheet pan and drizzle with 2 tablespoons olive oil. Season with salt and toss to combine. Roast the squash until nearly fork tender, approximately 30 to 40 minutes. Add the cranberries for the last 5 or 10 minutes of roasting. Meanwhile, combine the apple juice (or cider), vinegar, and shallot in a small saucepan. Heat to a boil over medium high and cook until reduced to approximately 1/4 cup, approximately 10 minutes. Remove from the heat and whisk in the mustard and remaining 1/4 cup olive oil until well blended. Taste for seasoning and add kosher salt and pepper as desired. Place mixed greens on a plate and top with squash. Dress with just enough vinaigrette to moisten the salad and garnish with Parmesan. Heat the oven to 350 and line a sheet pan with aluminum foil. Cut the squash in half, remove the seeds and strings, and place face down on the sheet pan. Cut the onion in half through the root end and place cut side down on the pan. Bake for 30 minutes. After 30 minutes, cut the apples in half, cut out the cores, and add cut side down to the pan. Bake for another 45 minutes or until a fork easily pierces into the vegetables and apples. Allow everything to cool completely. Once the vegetables and apples are cooled, heat the olive oil in a dutch oven over medium heat. Add the curry paste and let cook for approximately 1 minute. Add the mango chutney and cook 1 to 2 minutes more. Using a spoon, or your hands, remove the flesh of the squash and apples from the skins. Add the flesh, along with the onions, to the pot. Stir to combine and cook for 1 minute. Add 3 cups of chicken broth and bring to a simmer. Remove from the heat and use a stick blender to puree the soup. Alternately, this can be done in several batches in a food processor or blender. Once the soup is completely pureed, add additional chicken broth to thin to your desired consistency. Season to taste with salt and pepper. I like my vinaigrette on the acidic side, too! Other people may find them puckery, but I love them that way! Thank you TKW, I was starting to feel like some kind of freak because I don’t like a heavy, oily vinaigrette.